Anyone that's stopped by House of Nomad’s studio knows we're animal lovers! The first person to greet you at the door is Berk's Springer Spaniel, Shelby -- and now, Kell's pup Frankie, a 12-week old tricolored French bulldog! We adore animals and since our very first project, love incorporating cats and dogs alike into almost every space we've designed. With a new pup around the office, it got us reminiscing on our favorite projects where the client's family pets got a little camera time. Here’s a little bit about each space we designed, and how we considered the pets in the design decisions! This 1940s design project was especially meaningful because it was for neighbors of HON co-owner Berkeley Minkhorst! Not only do we just love the family, but HON is attached to this house because it was the former home of HON’s very first clients! The most beautiful part of this photo is the family’s boxer, with the dearest personality — and we love that she made it into our photoshoot. Their 40s Myers Park home has integral history and charm but after numerous additions, they were left with a funky flow downstairs and came to HON to rework the design of the space. HON’s goal was to take some of the Americana style the duo both loves, funk it up a bit and bridge the vibe to the rest of the rooms in their downstairs. With their pet in mind, HON selected a gorgeous antique overdyed rug. Design tip: Overdyed designs easily camouflage stains, are durable and easy to clean! This is the sweetest dog you will ever meet — this family goldendoodle was very excited to pose for the camera. Last summer, we were hired by a charming mini-client (daughter of former clients who HON adores!) in Mountain Island Lake, who said she loved to read and dreamed of a dedicated crafting space in her room. HON incorporated a desk and shelf for crafting supplies and went with a bookish Kate Spade wallpaper. The full reveal was just beautiful (she gasped with joy!) and her room is stylish with the accent wall, functional with crafting and reading areas — and all around beautifully cozy. Kelley’s doll-face Persian, Oliver, came to LIFE the day our photographer, Laura Sumrak, photographed Kell’s home! While usually camera shy (Oliver won’t ever put his best face forward for Kell’s shots!) — he kept perching in the perfect frames for the camera. Kell’s modern new build in NoDA is eclectic, and full of global finds from HON and personal travels — check out Domino Mag’s feature for more! Considering Oliver (and now their new pup, Frankie! ), Kell took into account the color of her animals — with shedding in mind. So Kell went with a multicolored rug. Kell also went with a Crypton fabric for her sofa (pictured above left) because of its durability! 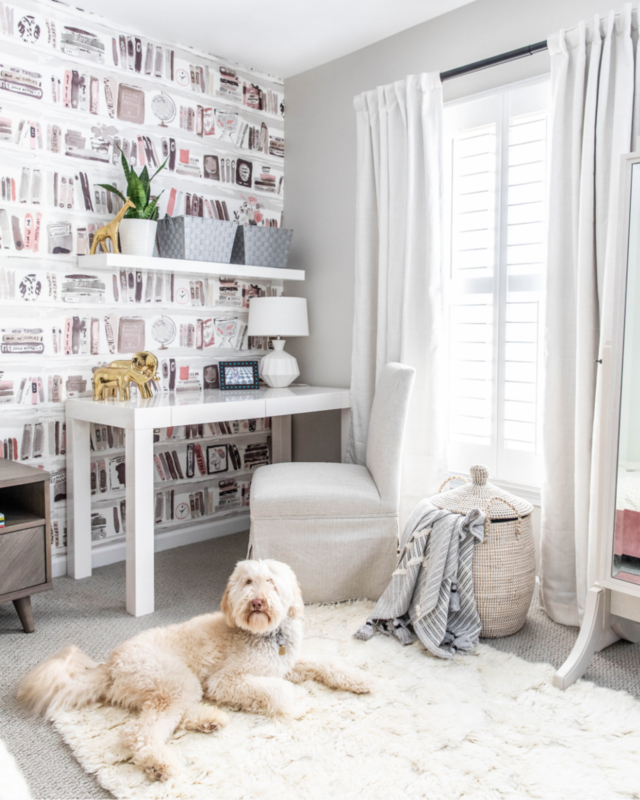 Design tip: Crypton is a durable upholstery choice (for kids or pets alike!). Not only does it fight against stains but is resistant to scratching/claws. This precious ragdoll cat was very excited about her baby sister coming along! One of the very first designs HON did, this Dilworth nursery is playful and neutral — and the perfect spot for a catnap, and her baby sister to grow up in! An early project by HON, this playful space in Plaza Midwood included lovely clients — and their sweet Golden Retreiver, Bailey. These clients approached Berk and Kell asking for design assistance in bridging the two spaces together. Berk and Kell went with a statement wall that pulls out the hues in the living room rug, which Bailey is clearly a fan of! They also went with a slipcovered sofa, which is a breeze to clean — if ever necessary. Design Tip: Consider a bright, 100% wool rug with pets! It’s great not just for hiding pet hair but is easy to clean. HON’s original office was in Berk’s house in Myers Park, and the walls were painted a gorgeous, bright blue hue — Vardo by Farrow & Ball. Shelby was a fan of the artistic space and spent every day there with Kell and Berk. Again, the rug selection was important with Shelby in mind, so the duo went with an indoor/outdoor rug, which is both a fun, graphic print — and has longevity to it. Last sumer, House of Nomad finally found their way out of Berk’s home office and into our very own studio in South End’s Atherton Lofts. Exposed beams, massive windows, light drenched spaces — it’s a dream! The designs are always evolving as fresh finds are brought back from Berk and Kell’s sourcing trips for our dedicated shopping area (open to the public by appointment and online!). 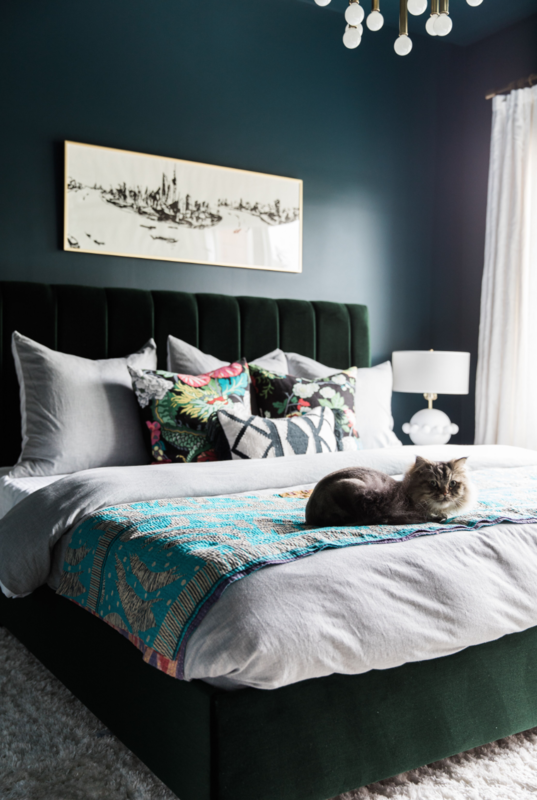 Berk and Kell loved taking risks in designing the studio, including Shelby’s favorite spot to camoflauge herself— a bold, black and white patterned sofa. Shelby is also obsessively drawn to the Moroccan rugs and Frankie to the poufs! Cheers to all the CLT pets we’ve grown to love as we’ve designed spaces across the Queen City! Photos taken by the talented Laura Sumrak!